If you're anything like me, you go through lots of hand sanitizer. I have it everywhere - kitchen, bathroom, car, bag, you name it. With back to school in high gear and cold and flu season creeping in, I know I'm only going to be using more and more. One of the problems I have though is dry hands. It doesn't matter how much lotion I use those puppies just can't seem to stay hydrated. Cold weather plus hand sanitizer equals very sad hands for me! That's why I was excited to try out Mother's Therapy Organics products. They are a woman owned company that uses natural and organic ingredients in their products. For their hand sanitizer they use natural alcohol in addition to aloe vera, Echinacea, goldenseal, and lavender oil. The end result? 99.9% of germs are killed and your hands are still soft. A total win/win. The products also have a light cucumber scent as opposed to a chemical smell which is nice. I also really like the Germ-Fightin Hand Lotion. It is non-greasy and a little goes a long way. Mother's Therapy products are currently available exclusively through Amazon. You can purchase them HERE . Now they are more expensive than regular hand sanitizer but the price is comparable if you compare it to purchasing an organic/natural product. 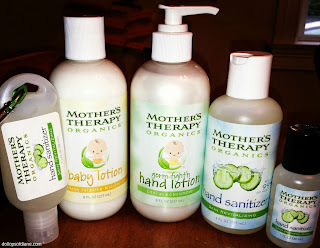 So with the help of Mother's Therapy, I'm hoping to keep my hands germ free and hydrated over these upcoming months!